In this time of recession and economic unease, it’s easy to qualify Kelly Reichardt’s Wendy and Lucy as merely an exemplary critique of America’s domestic issues and social ills. But much like the dreary and simplistic headlines dominating our current state of affairs, this sort of analysis doesn’t get at the heart of the problem, or this incredibly fascinating picture. The film goes far beyond the surface tragedy of its premise, which finds a young drifter named Wendy (Michelle Williams) and her canine companion Lucy suddenly stranded in a small Oregon town, momentarily halting her trek to Alaska in search of work at the canneries. Much like WALL•E and Shotgun Stories, Wendy and Lucy is incredibly focused, churning sound, mise-en-scene, and camera into a distinct and engaging relationship between time and space. The film becomes an aesthetic response to pressing ideas concerning class and family, challenging the strict definitions of such terms through the nuances of human interaction. The film begins with a methodical long take following Wendy and Lucy through a dense forest/park, passing by trees, through darkness and light, all while highlighting the ambience of nature and setting up a spatial poetry linked to this specific moment in time. Wendy and Lucy ends with another stretching of temporal space, this time within the constricting confines of a railroad car headed into the unknown distance. Every element/plot point/monologue in between comes to define this aesthetic arc and Wendy’s slow and somber road to isolation and unanimity. With Old Joy already a wondrous notch in her indie gun belt, Kelly Reichardt moves a step toward master status with Wendy and Lucy. This film is not just about the politics of inaction, or the social ramifications of poverty, or any other theoretical points that inevitably lose track of the very real fact that human beings are losing the very objects that define their humanity. Wendy and Lucy transcends these ideas and becomes such an object, a corollary to the indulgence of greed and self-righteousness, for Reichardt, for movies in general, and most importantly for the viewer. 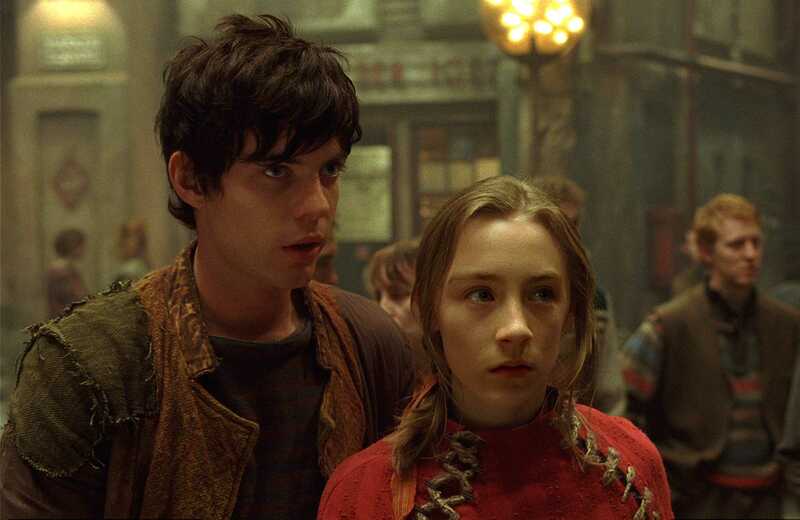 Gil Kenan’s City of Ember is a challenging, audacious, and dark children’s parable of great heft, so no wonder it failed at the box office. From it’s stark opening voice-over musing about the “day the world ended” to the cavernous subterranean home sweet home occupied by human survivors hundreds of years in the future, City of Ember charts a singular battle between public innovation and selfishness, waged between characters seeking escape and those bent on subverting progress. Political and social undertones fill the frame as the crumbling underground city of the film’s title begins to systematically shut down due to malcontent, laissez-faire politics, and apathy. That City of Ember consistently entertains is almost an afterthought due to the dense subtext, but the film has an undeniable energy personified by its many great actors (Tim Robbins, Bill Murray, and Martin Landau just to name a few) and the urgency of the narrative. City of Ember makes for a fascinating double bill with Andrew Stanton’s masterpiece WALL•E, as each envisions a future torn between doomed stasis and invigorating limitlessness, where children and robots express the very best humanity has to offer while revealing the doubts and inadequacies of constricting corporate agendas. Laura Palmer’s brutal demise begins the great Frost/Lynch television show and ends its maddening film prequel, a pertinent fact when discussing each as an entity of a greater Lynch universe. But that’s a different thesis paper entirely. Fire Walk With Me fails to attain the show’s greatness because Laura’s conflicted life can never match the impact of her “tragic” death. Twin Peaks has never been about Laura as a character, but what her image/likeness means toward instigating and uprooting the other characters’ true motivations. In this sense, she’s a martyr for both Lynch as a filmmaker and his battleground of psychological warfare. The most interesting element of Fire Walk With Me remains its stunning opening sequence which follows an FBI agent’s (Chris Isaak) brief but potent investigation of the Theresa Banks murder, an act Lynch treats more as a precursor rather than a story all its own. The ramifications of her tragic life end up transcending Laura’s. Fragmented memory defines Waltz With Bashir, Ari Folman’s surreal and horrifying remembrance of his role in the Sabra and Shatila refugee camp massacres during the 1982 war between Israel and Lebanon. Through the striking possibilities of Animation, Folman explores the many versions of trauma, mixing interviews with fellow soldiers and a reporter with hypnotic and often brutal flashbacks of the multiple front conflict, all in a desperate attempt to clarify the past. Yet the film is not about knowing the guilt of inaction, or recognizing that these atrocities occurred, but dealing with the constant and natural repression of such events from our mind. Many critics have noted the glaring timeliness of the film in the light of the current Israeli occupation of the Gaza Strip, and the final images of broken children buried under rubble certainly calls to mind these connections. That the film merely scratches the surface of these events and the characters involved is a testament to its urgency, but it also leaves many questions unanswered. Like it’s tormented hero, Waltz With Bashir will be looking for closure forever, just another cost of experiencing the terrors of war and living to tell about it. But while the Palestinian innocents continue to suffter, at least Folman has a platform to grieve. In each of his four feature films, director Sam Mendes finds tragedy in families on the edge of collapse, be it within the United States Military in Jarhead, or the nuclear ones in American Beauty, Road to Perdition, and now Revolutionary Road. More interestingly though, Mendes is one of the few Western directors to truly genre hop, from Melodrama, to Gangster, to War film, autuerist motifs/themes/ mise-en-scene in tow. While Revolutionary Road might initially be perceived as a marital war of words, it contains multiple elements of Horror which stand out as the film progresses. As the young couple (Kate Winslet and Leonardo DiCaprio) living in 1950’s suburbia struggle to find relevance in the suffocating confines of conformity, Mendes manipulates their seemingly sunny locale with cavernous close-ups and harsh strands of light. This breaking marriage weaves excuses, lies, and tenderness together to form a timeline of inadequacy, Roger Deakins’ hypnotically menacing camera constantly hovering throughout. Only Michael Shannon’s mental patient PhD sees this couple for who they are, and has the brass to say so in two dynamic scenes of comeuppance. The anger, anguish, and betrayal culminate into one striking image toward the end of the film, where the small dripping vibrancy of red overwhelms the monochromatic space, finally juxtaposing the destructive qualities of limitation and weakness with the fear at the heart of such emotions. This suburban nightmare has many monsters lurking underneath the surface, waiting for a time to passively reveal their crippling perceptions about family, tradition, and image. The silence is almost too much to stand. The Academy Award Nominations will be announced on Thursday morning. This has been a down year for Hollywood after the great output from 2007, but there’s still plenty of good films to chose from. I’m attempting to catch up with some of the contenders but here’s a purely tertiary list of films I think will get nominated for the top six categories. Also, for fun, I’ve added my own choices for the award. Match Cuts Best Actor: Guillame Depardieu, The Duchess of Langeais – the other great tragedy of 2008 besides Ledger. Or, the destructive softening of Western badasses. Ed Harris’ curious deconstruction of Wild West stoicism is at times inept and surprisingly tedious. However, by the end of the film it’s revealed that ineptitude and tedium represent a key theme when looking at these particular characters’ weaknesses. Rene Zellwegger’s character, a flimsy tart who strolls into town and manipulates a power struggle between a legendary lawman (Harris) and an Eastern thug (Jeremy Irons), unearths the whiney undertones of both hero and villain by flocking from one to the next depending who has the power. The film’s conscience, played by Viggo Mortensen, watches in terror as his ideological code crumbles before him. Unlike the kinetic gunplay of Open Range or even Unforgiven, Appaloosa paints violence in broad and lifeless tones, more offshoots of the dramatic crisis between the characters than genre conventions. As a Western lover, I can’t say Appaloosa is that enjoyable, simply because it attempts to show these Western archetypes as simpletons looking for the basic necessities of life – love, stability, and identity. Locale and lingo play almost no role in this character study, and as Mortensen’s roughneck rides into the sunset disappointed and dejected, we can’t help but share his confusion. Where have all the heroes gone? According to Appaloosa, they weren’t there in the first place.